Just watched Steve Jobs’ keynote speech for the launch of iPhone. He is such a good speaker and I cannot imagine anyone replacing him as the best spokesman for Apple. 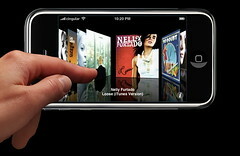 The iPhone was not a big surprise, as rumors had been around for a LONG time. However, the sleek look of the phone and the touch screen User-Interface still fascinated me. I liked Apple’s approach to small electronics. They built software to support their own hardware and the hard work definitely paid back. The success of Intel-based Macs and iPod showed their strength. No one else could do the same, well, except Microsoft (remember, they released Zune … ). This entry was posted on Tuesday, January 9th, 2007 at 8:04 pm	and is filed under SiteNews. You can follow any responses to this entry through the RSS 2.0 feed. You can leave a response, or trackback from your own site. Nice post man i just signed up to flickr to! I recently discovered this blog. I’ve had a similiar idea to your rewriting the ten commandments for some time now. Excellent essay and site. I put a link to your compassion essay on my website. Good work. I actually like this game beettr than the actual tv show, probably because I finally get credit for answering the questions right! So far I have only played this game by myself, but you can play up to 4 players which looks like a lot of fun! The questions are challenging and they get harder as they go up for higher monetary values. There are over 2,500 unique questions which is nice because it will take me awhile to go through all of them! The game also includes the tv show features like Phone-A-Friend, which it calls a friend in the game and tells you there answer and the percentage accurate they believe they are, the Ask the Audience which tells you via the percentages what the audience thinks the answer is, and Double Dip which lets you pick a second answer if your first is wrong. You can also choose to Walk Away, but I just keep on guessing! You have to answer a set amount of questions to mark yourself at a set point which you then earn money, for example if you answer the third question wrong you win nothing but if you answer the fifth question right then you win $5000 and so on. Winning money opens up wardobe items to customize your avatar which are neat but I don’t care too much about dressing my avatar. There are though tons of awards you could win which are challenges in themselves, like answering X questions correctly within 25 seconds, not using lifelines, and so on. Overall, I like the game and think it is challenging with its questions, although it is nice because it tells you the few upcoming topics, so if you know you are going to struggle with one then maybe you will save your lifelines or just Walk Away American History is not a strong subject for me! I think this game will be really fun though with three other friends in the Party Mode. You also can’t select a skill level (Beginner, Medium, Hard) so this game wouldn’t be good for kids too young, but if they like the show then they will like the game! Thank you so much for sharing a very informative article.. now i am trying to get some more speed in my wordpress site. Comment’s author: Holy08/13/07 04:21:00 AM老實說….我不知道是處男為什麼會讓人笑倒在地上我沒跟台灣的留學生玩過真心話大冒險, 不過跟外國學生玩過類似的他們也是問我類似的問題(看來全世界的人感興趣的事都一樣 XD , 我也是回答我是處男沒有人笑, 倒是有一個人說了一句話, 讓我們每個人都舉杯致敬…. 有些東西是你曾經擁有, 而一旦失去的就永遠拿不回來, 處男女就是其中之一…. 台灣的夏天真的是又濕又熱….我一直覺得男生適合活在在冬天, 而女生適合活在在夏天男生要穿的好看, 有時要襯衫和外套….夏天完全不行喔….還有要注意鞋子….因為女生 至少外國女生 會注意男生的鞋子我曾經穿過一雙鞋子….前十個稱讚的裡面有九個是女的….剩的那一個是gay…. My spouse and i just wished to compose the note to be able to thank a person for all of the superb points you might be giving out here. Our rather long net look up has now been recently recognized together with reliable tips for you to go over along with my own two friends. My spouse and i would suppose that will most of us visitors actually are truly blessed to be able to dwell throughout a superb network together with many lovely professionals along with great secretssolutions. I feel pretty blessed to possess encountered your web page and look to really more entertaining minutes reading right here. Thanks a lot once more with regard to everything.